The chest wall deformities most frequently encountered are those of the manubrium, including pectus carinatum, pectus excavatum, and a prominent costosternal junction. Rib torsion, rib rotation, sunken chest deformity, and flaring of the lower costal cartilages are also seen. Poland’s syndrome is recognizable not only by a chest wall deformity but by the variable loss of the pectoralis major muscle on the affected side and the possibility of hand and axillary deformities. The presence and the degree of deformity, when considered, may alter the technique for optimal correction. The reconstructive options that have been used for patients with the most severe deformities include tissue expansion, microvascular surgery, and thoracic surgical approaches. Boniness of the chest caused by prominence of the manubriosternal area can be addressed by high and medial placement of breast prostheses. 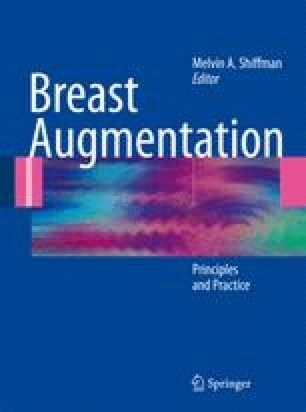 Customized or prefabricated solid chest wall implants have been used in conjunction with breast prostheses to treat patients presenting for breast enhancement who have significant chest wall deformities.